59 Club Meet Up is always fun! Well, it was that time once again for us to sling our legs over our machines and head on out to Roscoes deli and Bar in Downtown Fullerton for our Monthly meet up, seeing as it stays light in the evening now, this was our first meet up here since last year, and what a cool turn out it was too. 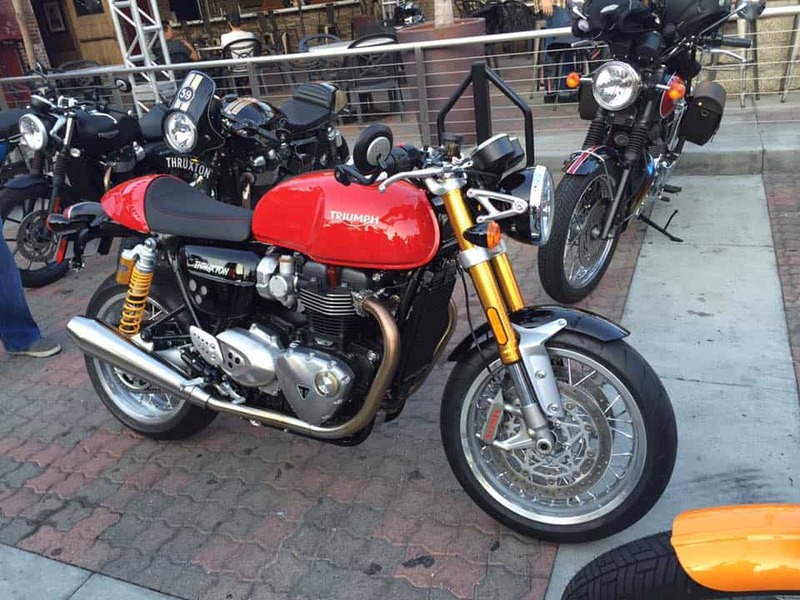 Not only did many of our members turn up, the Brand New 2016 Triumph Thruxton R that I test rode earlier in the day from Southern California Triumph in Brea ,who kindly offered me the opportunity to have a blast on the 100 HP Beast, thundered into the parking lot, to the amazement of many. The weather was perfect for our meet up and the bar was busy too, with superb Sandwiches to scoff on and beer in massive Glass Trophy style Goblets to partake in liquid refreshment. It was a great evening and 18 Motorcycles showed up and enjoyed the camaraderie amongst everyone at this cool venue in Fullerton. That’s my girlfriend “Jennifer’s” mean machine and her mum made the cover for her T100, looks wicked eh? Plenty of people came out and had a look and, as the evenings are lighter now, we shall continue to have a meet up here at Roscoes. Corey’s Custom Bonny is at the top of the parking lot and Very Hot Roddy along with pinstriped Skid lid. Even a New Speed twin attended of which I shall be making Megaphones for and should give it a more aggressive growl. Plenty of eye candy to take in at this great Bar and grill and if you can make it out one of these evenings, you will enjoy it for sure. Nice to have this cool group with no attitude, just a passion for Motorcycles and its lifestyle with the 59 Club O.C. We had a Plethora of style, Cafe, Scrambler and Bonny all on parade. James O’Donnell Rides his Thruxton all over the place and got the Trophy for best attendance a few weeks back with the club. This guy is a True Iconic Fellon, but thats just his last name. No not iconic. Above, a good mate Steve Martinez and his stunning Black and Silver Thruxton of which he rides regularly. Plenty of things to look at at Roscoes itself but tonight it was the parking lot that grabbed the attention. My Girlfriend Jennifer rode up on her T100, she loves this machine and is a New rider and gets more and more miles under her belt when she can. Above, Steve Fellon with the “Slave Master “club hat, enjoys our buddies 175 Honda and brings back good memories. Above, Amanda talks to Jennifer on how she likes to Wheelie where ever she can on her way to work each morning. LOL! A great amount of British iron here tonight and we all had an awesome time, try and make it along to a meet up of ours sometime. Fellon having relapses of jumping off curbs and running across farmers property back in the day. The lads from Southern California Triumph Motorcycles came along and bought the New Thruxton R to show it off to all. But they had to have a few Beers first to settle their nerves. Barry- AKA- “Bare” found a short cut to our meeting, great fella and his Guzzi Racer was sat all proud. Above, Michael David Smith arrived on his trumpy, works many hours but always makes time for the club meet, thats dedication for you. Some of the Lads chewing the fat, whilst I was chewing on a Sandwich! Julie jumps on the New Thruxton R and that 1200 cc feels appealing from her 175 Honda thats for certain and she fits the bike very well indeed. Corey and his lovely wife Julie admire the New Thruxton and Corey contemplates his Mrs blowing the doors off his Bonny if she bought it. Fits this Thruxton R like a glove, its a fun bike as I rode it this morning and has bags of Torque. Every digs the roar of the Stainless Steel megaphones as Julie hits the loud button and her old man comes to investigate. So many bikes and a warm evening made this meet up very memorable and nothing to do with Kobe’s last game on the tv either. I always enjoy our 59 Club events and people all seem to have fun, swap stories and genuinely enjoy the evening with everyone. There is Julie again on that Thruxton, its a wicked machine and Id love to have that in my own stable. I can see the figures running through her mid if this is a plausible deal for her, this is truly a 100 Horse Torque Monster. The Girl of my Dreams Jennifer, rides me me as much as she can, and enjoys organizing 59 club events. More Trump here than Donald! My 2013 Thruxton sits patiently, I truly love riding my cafe, its all dialed in and I enjoy the Canyons when I can. This sure would get him to work a little faster, but he has a Thruxton 900 and thats so much fun anyway. Maybe if the Lotto numbers come up he can grab this and keep both machines and teach his Girlfriend Carole how to ride? Our mate Eric Dye has a Trumpy that you can never lose in a parking lot, this tangerine dream is a sweet ride. Oh Oh- Is Corey working out what the Payments would be on that Thruxton R? Seat comes off with a flick of the key on the New Thruxton R.
The Triumph Seat now a concealed compartment for all things you need with you, Registration, Glock, etc. Our members all having a great time as we enjoy the now lighter nights and some fun rides coming up on the calendar. Love all the old signs and memorabilia at Roscoes, it really is a great place to meet up with friends in Fullerton. The Night is drawing in but the fun continues as we all eat, drink and enjoy a fun evening of laughter. Carlos pulled up on his Thruxton with his New fairing attached. With More Fog Lights than a East Anglian British Sea Side Light house, this bike gets noticed. Carlos will be painting this Black with checkers, s stay tuned for more. Off goes Carlos with more wattage than a nuclear power plant. This 2016 Thruxton is all machine as I rode it and took it into the Canyon, it is responsive, Torquey and boy does it Growl! Looks great as the Sun was going down, if you can get a chance to take this for a test ride, do so as they are a fun machine but- watch the power in the first 2 gears and she will lift up like a Cutter through an Ice pack! Getting ready to go and another fun evening was had by all, thanks for coming. Ode and Michael David Smith get suited and Booted and get ready to jump on their steeds and head home. Amanda gives us the secret Cringe as she struggles to pull her Scottish wallet from her Jacket, whilst Jennifer smiles. This entry was posted in Blog and tagged 59 club, ace cafe, Bell, Biltwell, bonneville, brit iron, busy bee cafe, cafe racer, caff, cb750, davida, great britain, Honda, North london, orange county, rockers, Speed twin Thruxton R, t100, T120, Thructon Ace, thruxton, ton up, triumph, Union Jack.